In the last ten days I’ve been back and forth between the Cairngorms, Lochaber and the North West. At higher elevations there is now a superb winter base, though more recently in Lochaber and much of the Northern Cairngorms there is just too much snow! In the last month I have seen the sun on only the briefest occasions, and most days have been difficult both to guide clients, and to take photographs. I remember the Scottish winter being tough, but the last month has made working in the Antarctic winter seem like child’s play. The combination of near melting temperatures and relentless, savage winds is particularly challenging. It means you are only going to last as long as you have spare gloves to change into, as each pair gets saturated sooner or later. I really like working in cold climates, but the damp winters we have in Scotland are tough. I have great respect for those that work here year on year. They are hard folk indeed. 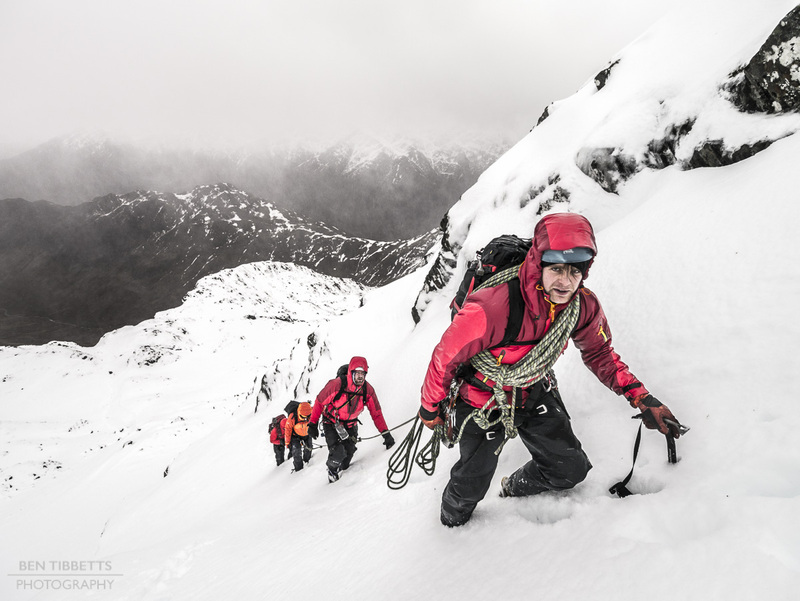 On the 30th December I was out with Martin Moran and clients on Liathach, and despite being in among the clouds most of the day , with squalls of snow here and there, conditions under foot were excellent. On New years eve we woke up to a lashing wind even in the glens, and Martin’s plan was to head up onto the side of The Saddle in Glen Sheil to try to find some shelter and teach some snow leading skills. Alex Moran leading clients up The Saddle. Alex Moran teaching clients to lead on snow. The snow, rain and wind were utterly unrelenting until the late afternoon, by which time my camera was saturated…! New years was passed with friends near Roybridge, with a bonfire by the river, and most folk taking a ritual bathing. My body declined, having being fairly well abused by the last few days. Back in the east on the 2nd January I went out to shadow Graeme Ettle, the course director of the BMG winter test, with a client in Coire an t-Sneachda to see how it’s meant to be done. Looking down Fluted Buttress, Greame and his client, Greame. By the end of the first week of January the Northern Corries were plastered with snow, and have remained so through the brief thaw cycles this week. The wind has been blowing and drifting snow in from everywhere it can. The loading of slopes has been up to critical levels, with many large natural slides in evidence throughout these corries and the Loch Avon basin. 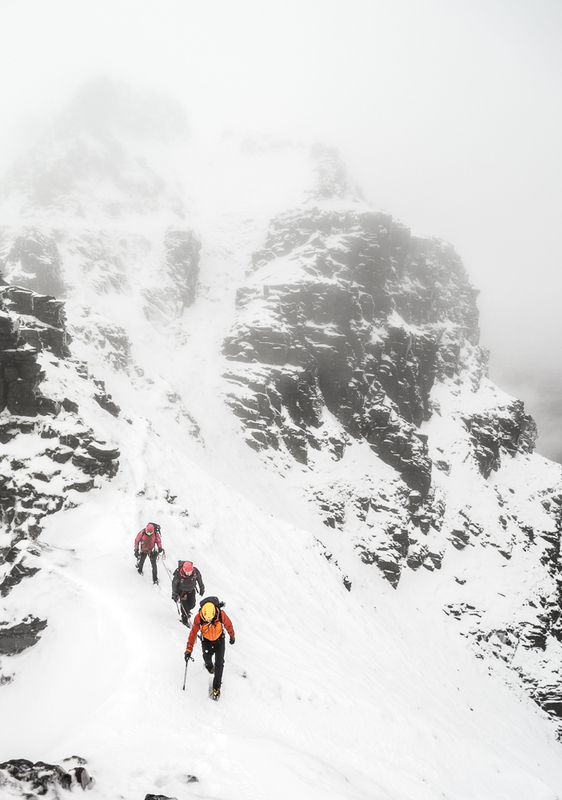 On the 4th January I headed back up NW to take a client of Martin Moran’s along Liathach ridge. The day started of with a few squalls and the cloud base down. By the afternoon however, when we had gotten through the technicalities of the Pinnacles, it lifted to provide some long awaited views across to Fisherfield and An Teallach. In the North West the snow is more confined to the mountain tops as the wet thawing air has had a more destructive effect on the snow cover than it has on the higher hills of Lochaber, or the Cairngorms. 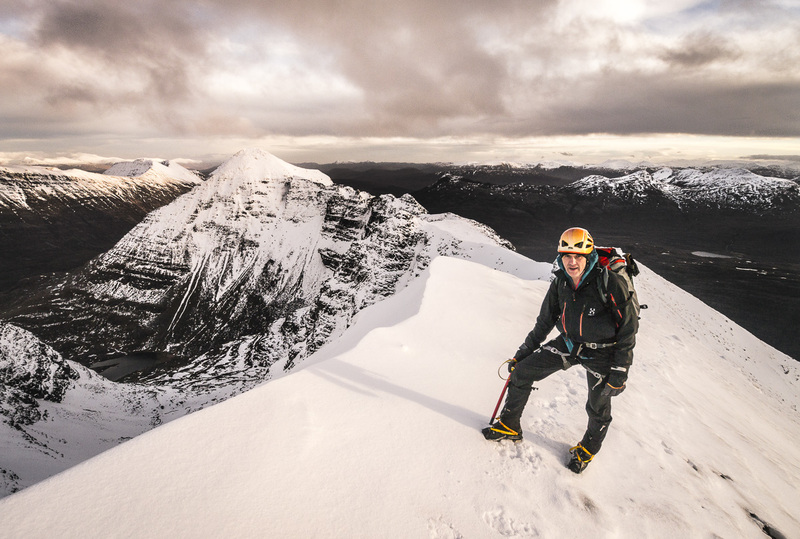 Iain Mitchell on the west summit of Liathach. A rare clearing of the skies. 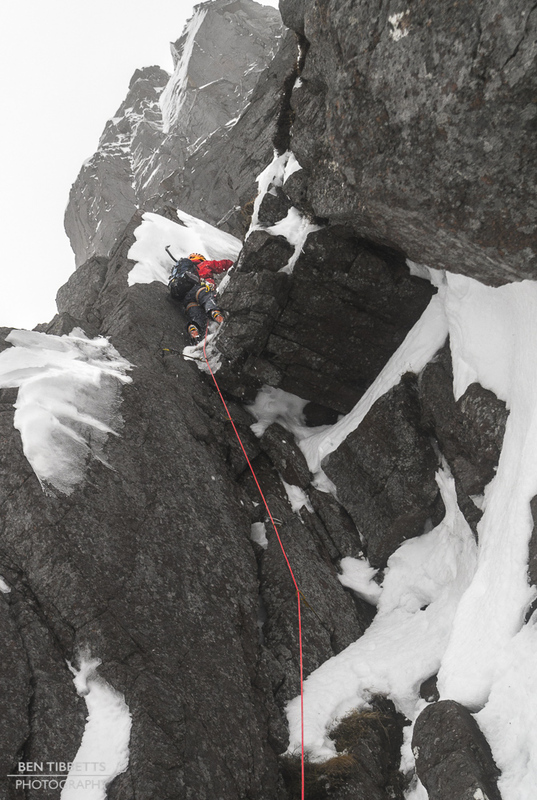 The next day, the 5th January I was back in Coire an t- Sneachda. With a massive amount of snow having fallen overnight, driven by the incessant wind, the north and easterly slopes were massively loaded again with unstable snow. I went in with a novice friend, Pam van der Brug, in search of some amenable yet safe terrain. We climbed up Spiral Gully and then the direct finish. 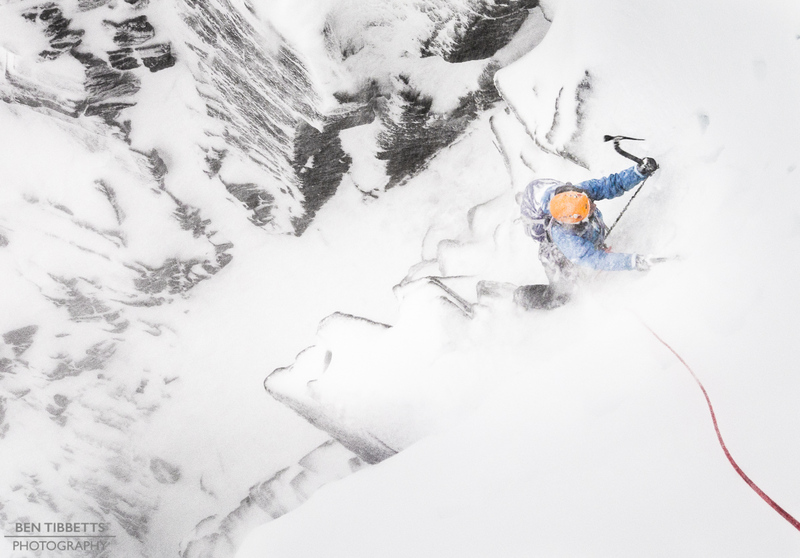 By now the vast amounts of snow are making it rather difficult to find rock belays and gear. 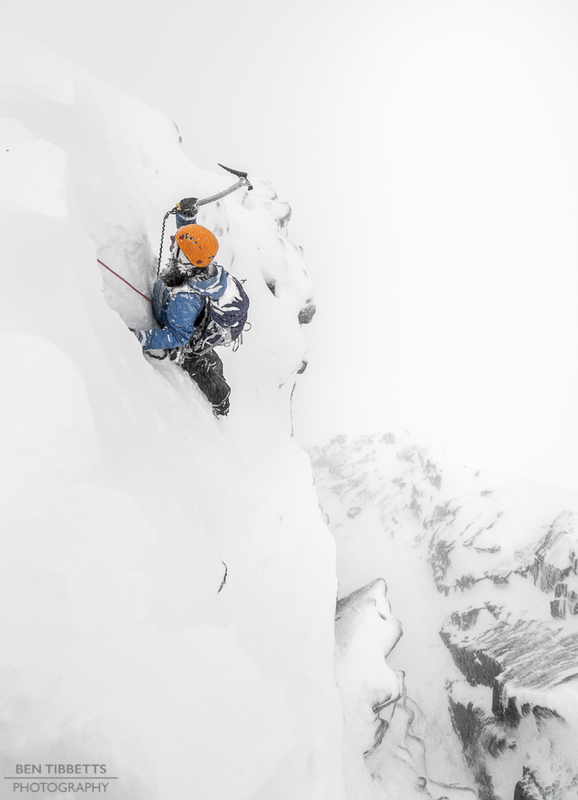 Pam battling in the maelstrom on her first winter climb, Spiral Gully Direct. 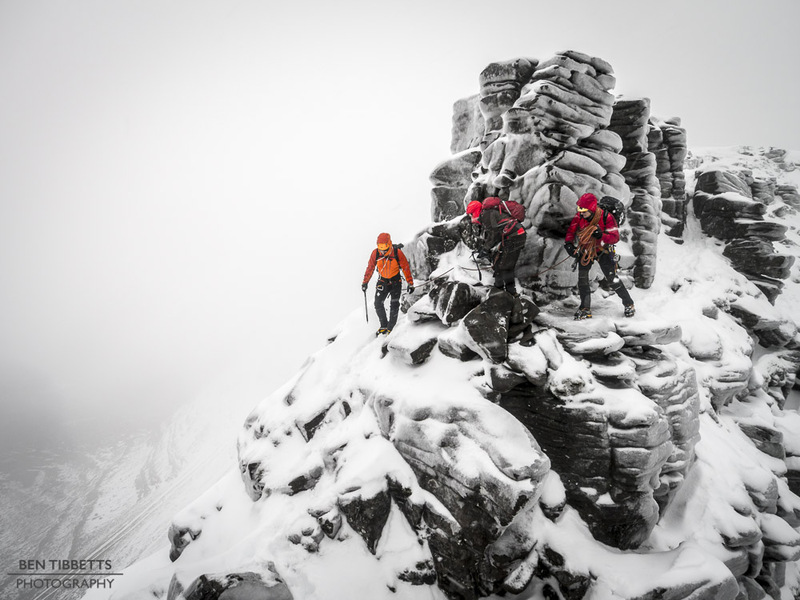 We topped out onto the plateau in one of it’s more savage moments, requiring a stunted braced stride to make progress. Not wanting to try the loaded slopes of the Goat Track we headed back across to pt. 1141 and descended Fiacaill a’ Choire Chais. Monday was Armageddon day throughout the British Isles and I hid indoors, thankful for a rest. 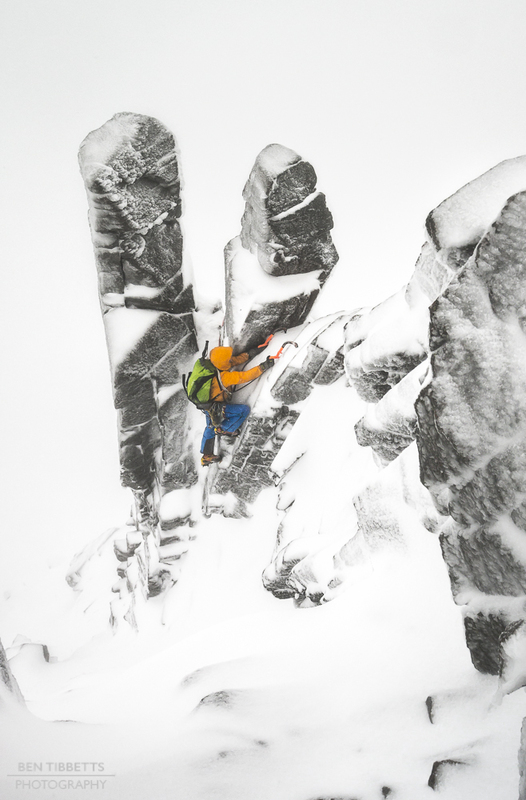 Tuesday (7th Jan) I went into Coire an Lochain with Jake Phillips and his girlfriend Mandy Tee in the hope of finding some shelter high in the coire from the howling winds. It was forecast to be slightly improved, but was still heinous. We swam up Milky Way, finding only a few bits of gear in the whole route despite relentless digging. 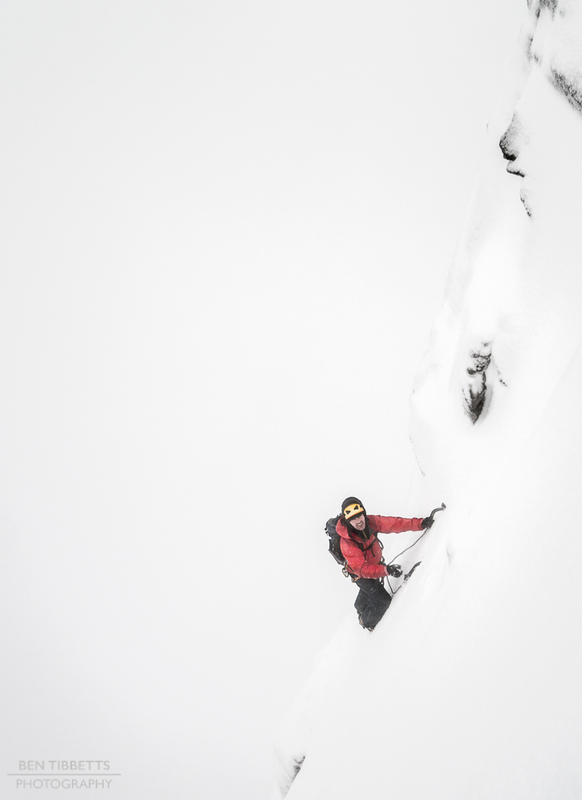 The cornice was engaging and then the mediocre seat belay on the plateau seemed interminable. The camera didn’t come out of the bag all day. On Wednesday Jake and I went over to the Loch Avon basin to try the southerly, less loaded aspects. We climbed Afterthought Arete and Apex Gulley on Stag rocks. Conditions on these windward slopes had taken the full brunt of a thawing wind were marginal. The Shelterstone and Carn Etchachan looked in pretty difficult conditions, loaded with snow and yet a bit too warm to refreeze. I really don’t know how I was thus convinced that it would be a good idea to go back again yesterday (9th Jan) to climb something there. 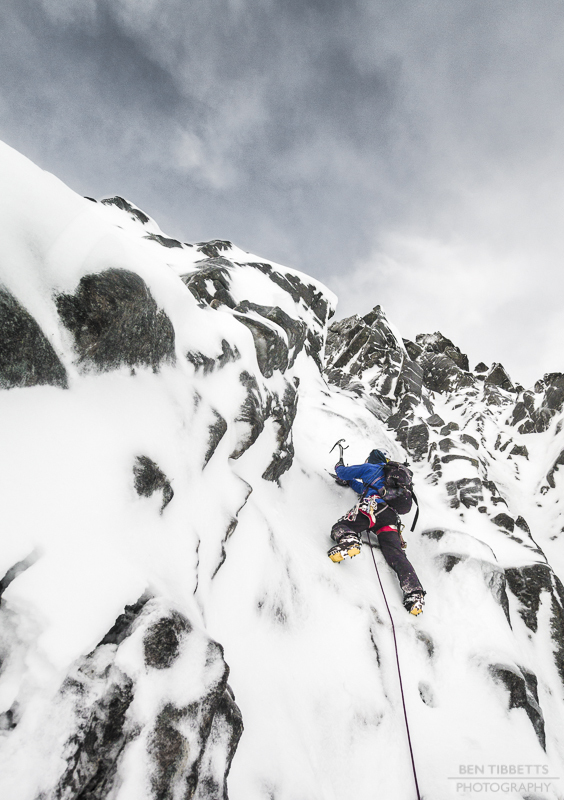 With Will Sim and Kenny Grant we climbed up out of Coire an T-Sneachda via Fingers Ridge. But where is it? Kenny Grant. Who stole Fingers Ridge? Will Sim on Fingers Ridge. Towards the top of the buttress Kenny and Will found some rock and put a rope on for a pitch. By this time I had scooted of round the side to avoid the most engaging of the steep unconsolidated snow climbing! We then headed over the back to Loch Avon Basin. Kenny and I had planned a day out since the beginning of the week as it looked like the best weather. However it turned out to be like most others – windy and cloudy with some snow. We traversed round to the Shelterstone in search of some terrain that might be steep enough to not hold so much snow. 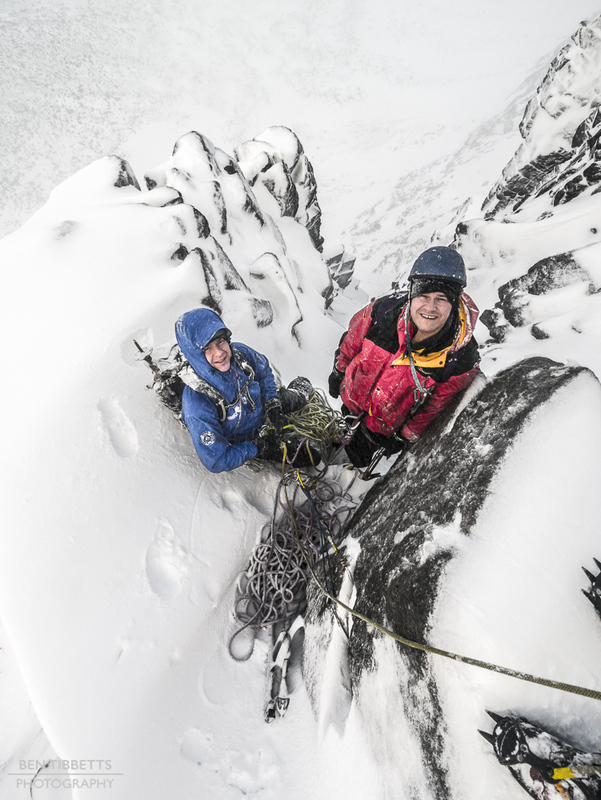 We started up Clach Dhian Chimney, and although it also had some unconsolidated snow, and was not well frozen, it had some good rock moves and provided interest. On the second pitch Kenny branched out left, and as we were standing at the belay Will mumbled about how this was the wrong way and was now going to be difficult to get back into the chimney/gully. We had planned to move fast and on easy routes so were climbing the three of us on just one single rope. Kenny Grant on the first pitch of Clach Dhian Chimney, Shelterstone Crag. Will is kind of like a Rain Man of climbing. He can see stuff that the rest of us don’t see, and of course he was right. The strata of rock meant that we had some heinous slab moves to break back right onto the line. 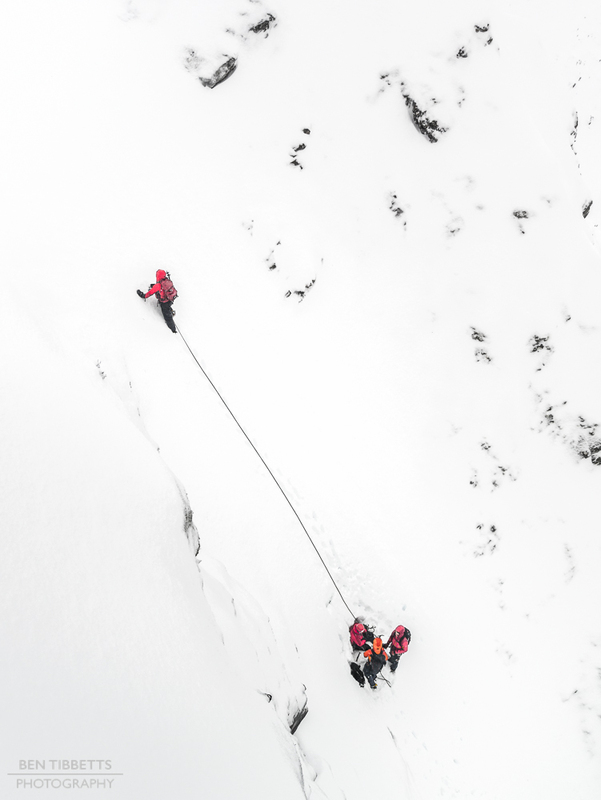 The line should have been pretty easy and quickly despatched under normal conditions.Nevertheless on the next pitch we got forced off the route by bizarre conditions – steep unconsolidated snow mushrooms in a steep chimney – and ended up climbing out into Pinnacle Gully. With some navigation practice we trundled back home across the plateau.